“Our first 3 shows were in Maine and I was not emotionally prepared for what I would experience. Our first show at Long Creek Youth Center was the hardest out of 13 total shows. During the discussion time afterwards, 12-18 year-old boys immediately opened up to us. After many thanks from various inmates, one boy shared about how both of his parents were drug addicts and being in that facility was better than his home life. He asked me for advice on how to stay clean and out of trouble in an environment like that. A few others shared about things they had witnessed and things that they could relate to from our dramas in the show. Then one boy rapped about his life; something he had written in his room (cell). In the rap he shared that his mom was killed in front of him at age 7 and everyone could see his hurt and his desire to do better and be a better person. Then a girl from our group named Mariah shared her testimony about her addiction, alcoholism and self-harm from the past and how she had turned to it because her mom chose alcoholism over her. Moments after she shared, a young man named Gabe from the crowd responded to Mariah and said, “Mariah, I went through the same thing. My parents chose drugs and alcohol over me and I thought I wasn’t worth it as well. I just want to let you know that your mom loves you so much and she may not have been able to show it, but she has and always will love you. She’s your mom and she has an addiction that takes over her mind. It is a disease; so don’t ever believe that she doesn’t love you, because she does. It’s just hard for her to show it.” Gabe was in there for attempting suicide, not for committing a crime, and yet he was ministering to us. He told us that “When we fight it’s because we are hurting. We have no other way of getting out our anger and hurt since crying shows weakness. I used to be in a dark place like that and I fought all the time. I’m just glad I’m not in that state of mind anymore”. The Women’s Re-Entry Program got to come and see us perform at the University we were practicing in and we even got to have lunch with them and talk with them. I sat with two women in their thirties. They were both in for drugs, one for drug trafficking and the other for drug possession while on probation. The next stop was Maine State Prison, our first maximum-security prison. I was slightly nervous when I saw the three layers of razor wire fencing, but once we were inside I wasn’t scared at all. Reality did hit though when I saw men being brought to the performance in their wheelchairs. I came to realize that these men will never get out and that they really do die in prison. However, after the performance, we had time to shake everyone’s hands and chat with them. I didn’t feel like I was in prison at all. The changed hearts of these men was beautiful. I was able to see behind their appearance. Many of the men encouraged me in my music and encouraged me to try out for The Voice, American Idol, etc. I left that day blessed by the inmates. We did a double-performance day at Mountain View Youth Center. The early-afternoon performance was with the Youth Center and the evening performance was with the Charleston Men’s Re-Entry Facility, which was right next door. We met many great and talented boys and even got to have dinner with them. I sat down next to a 14-year-old boy named Gavin. He didn’t make eye contact and didn’t really seem open to my conversation, but after a few minutes he started making eye contact with me and finally I got him to smile. By the end of dinner he had opened up to me about his family and mentioned that he wants to be a professional ping pong player one day. Meanwhile, he was becoming anxious with all the people around him and I didn’t know if he would lash out so I just kept him talking and smiling. He waved and smiled to me on his way out, as did most of the other boys we met. I could tell they enjoyed their time with us. At the conclusion of the Men’s Re-Entry performance that night, we received our first standing ovation. The men were so blessed by our performance and with less than 2 years left in their sentence, they needed some hope and love. It was a long, but successful day! The next four facilities (Sununu Youth Services Center, Metro Youth Services Center, Massachusetts Correctional Facility, and Bedford Hills Correctional Facility) were great. Numerous inmates continued to share their skills, raps and stories. The teenage girls looked up to me and were anxious to meet me after the show. It was a great feeling; however, I quickly noticed their immaturity, attachment issues and insecurities. The older women were very responsive and attentive. At this point in the tour, my mindset, perspective, opinions and self-image changed and I was eager to continue serving. I could not get enough! Riker’s island was a pain in the rear to get into. The staff at the female youth unit wasn’t very helpful and worked at their own pace. However, the first show at the women’s unit was amazing. We got a standing ovation and even did an encore. They didn’t want us to leave. The second performance at the male youth unit on the other hand was a different story. Students were split by age and gang. They were loud, obnoxious, rude and rowdy. However, once we got deeper into the program, they got quiet and listened. During response time, we had new questions that tested our faith and one of the males stood up and shared a full rap on his life. His mother was killed in front of him as a young boy and he shared what he saw and the outcomes. He went on to explain the broken relationship with his father and family and how he was considered a disgrace to his family. However, he concluded the rap with optimism and a plan for his future. While he rapped, kids from other gangs made comments and mocked him but he just stared right at them and kept rapping. By the end, all the inmates were cheering. I’ll never forget the day I completely felt God’s presence for the first time. I was praying constantly backstage for the performers on stage and I had been having issues with my voice, which was not good at all for the daily shows. However, every time I professed God as almighty, able, present and powerful, I felt a chill. And even as I was on stage, the moment I started to struggle, I would look up to the heavens from whence cometh my help and the notes just flowed out of my body. I cannot express the overwhelming feeling I experienced. So, despite the many complications at Riker’s Island, the performances were amazing. At the Riverside Correctional Facility for Women, those women were so excited to see us even before we performed. The room was packed and many different units filed in. I remember the women all standing up and singing “This Is It” by Kirk Franklin with us. One particular African American woman up front was in tears and sang “Take Me To The King” for everyone during discussion time - she was so full of joy and energy! I got to share about the addiction that runs in my family and had the opportunity to speak into these women’s lives. I was humbled to say the least. The last performance was huge! The whole Glenn Mills School was required to attend and our families were able to come see our last performance on tour. I met many amazing inmates and I knew that God had worked through me. Not only was He working through me but He was also working in me. I gained compassion, love and humility toward people I didn’t know and I learned to love myself through it all. August 21, 2014 (Jackson) - Dr. Stephen and Mrs. Carolyn Sachs led Belhaven music students and alumni on a choir mission trip to Austria over the summer. The team worked with House of Hope, an outreach for refugees from all over the world and used their musical gifts to perform in churches, parks and other venues in Linz, Austria. Dr. Stephen Sachs said, “We were taking western music back to a root area of western music, we were presenting music with excellence to a culture that highly values that music. We connected with their aesthetic right away with music. Our group became credible because the music was credible and that provided a vehicle for the gospel message to be shared. The group was comprised of alumni Anna Cullnane (’11), Brooke Edwards (’14), John Mathieu (’13), current students Beth Walczak, Rachel Walczak, Rachael McCartney and other choir members from Covenent Presbyterian Church in Jackson. They used performances as a way to talk with people about the Lord and develop relationships with the community and staff for future outreach. 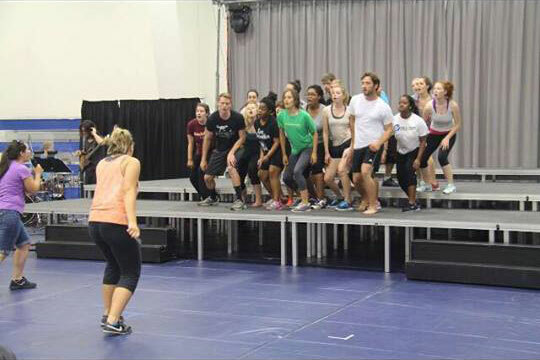 In spring 2013, five students from Belhaven University were among thirty students from across the United States chosen by Shining Light Ministries to be a part of a select performing arts ministry team for their summer Impact Tour. Shining Light's mission is to expand perspective and impact lives by taking a high-quality performing arts production to people in correctional facilities. This year's itinerary included Rikers Island in New York City, Riverside Women's Correctional Facility in Philadelphia, Maine State Prison and 6 other youth and adult facilities throughout the Northeastern US. The three-week tour had a dual purpose of bringing hope through Jesus Christ to residents in these facilities and expanding the student participants' perspective of the world, themselves, and God. Shining Light received excellent audience responses at all the facilities. Comments from inmates such as, "Your coming here meant a lot to us; it meant hope, strength and encouragement," "It's comforting to know I'm not by myself, and to know that other people are praying and thinking about us "God makes sure we know He remembers us," "'you'll never truly realize what a difference it makes to us'," are an indication of the impact Shining Light events had among the 1,500+ people seen in audiences. Facility staffs are also affected through these events. After the performance for nearly 300 women at Philadelphia's Riverside Correctional Facility, Warden Terence Clark stated, "I find it amazing that we have kids of that age to actually come inside and be willing to help another person. It's very inspiring'"
"(I've learned) we're all people, it doesn't matter what side we're on. I've been completely transformed by the people I've been able to meet in these facilities." "I came into this experience thinking that I was gonna do the population of inmates a favor, or do God a favor by gracing people with my talent, and quickly God humbled me. Literally every day God opened my eyes to new things, about me, about my relationship with Him and about His grace." Recent Belhaven graduate Roddy Merritt '13 commented, "As a lead singer, this has been training for a future in music. It has redirected my focus in how I use my music and who my music reaches." Dance major Melody Stowe '16, found that the experience reinforced her career goals, "I've known for a while that I want to use dance to minister, or go into dance therapy. This Tour affirmed that." Another participant, Stephanie Morales, had long desired to be a part of Belhaven's dance program but doubted her ability to measure up to Belhaven's high standards. With a new confidence gained on the tour, in July she applied to Belhaven and was accepted as a dance major. Shining Light Ministries began in 1996 and has done presentations in 54 correctional facilities in 23 states. In the past, students were only recruited from schools in Pennsylvania. This was the first tour done with students recruited nationally, with participants from 15 colleges and universities in 9 states. The need for performing arts mission opportunities to enable students to put their skills to use in ministry has Shining Light planning more tours of this kind in the future and seeking opportunities to work more closely with colleges with performing arts program. 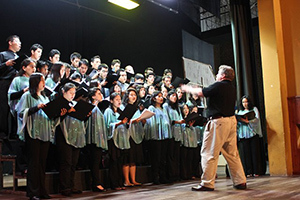 June 13, 2012 (Jackson) - Two Belhaven music professors, Dr.Christopher Shelt and Dr. Andrew Sauerwein, traveled to Trujillo, Peru and taught at the second largest national conservatory of music, the Conservatorio Carlos Valderrama. Rachel Reese ('10), a concert violinist and string instructor, invited them to come to Peru in May and teach. Reese has served as a full-time faculty member with the conservatory and music missionary with Peru Mission in Trujillo for the last year and a half. The goal for Reese and Peru Mission at the conservatory is to raise-up musical leadership for the growing number of newly planted churches in the greater Trujillo area. Dr. Shelt said: "The greatest treat we experienced was seeing Rachel Reese in action. Her mastery of Spanish, her adaptation to the culture, the respect she has earned in the musical community, and her earnest efforts on behalf of the Kingdom of God are nothing short of spectacular. Rachel has blossomed as a musician and as a person in this environment." Rachel was a participant, along with Dr. Shelt and Dr. Sauerwein, on the very first Belhaven Connections trip in 2007 and all three returned with a team in 2009. Belhaven Connections is the musical missions arm of the Belhaven University Department of Music. Reese is one of three Belhaven music graduates who have done full-time work in musical missions. Ellie Honea ('11) and Abi Lavallee Lowther ('98) are the other two music graduates that serve in Japan. While there, Dr. Shelt taught a course Training the Human Voice in four-hour sessions Monday through Thursday. "The conservatory students still remember our previous trips in their midst. They were extraordinarily eager learners, sponges absorbing everything they were being taught. We also had times to share our personal testimonies with a number of students and to teach the foundations of a Christian Worldview of the Arts," said Dr. Shelt. Dr. Sauerwein, whose discipline is composition, looked at Peruvian students' compositions and gave critiques and advice. He also introduced Cobra, a composition by John Zorn that has no traditional musical notation and required the students to use improvisation. This was very popular among the Peruvian students. Dr. Shelt also rehearsed and directed the conservatory choir in Andre Thomas' "Keep your Lamps", Ken Parker's "Listen to the Hammer Ring" and Dr. Sauerwein's "The Lord in the Manger." To conclude the week's activities, Reese organized the first instrumental contest in the Trujillo area. A total of 19 contestants competed for prize money while Dr. Shelt and Dr. Sauerwein served on the panel of judges. Ellie Honea knew she needed her undergraduate degree, and that her gifting was in music. She assumed that God was blessing the path she saw for herself, but those carefully constructed plans crumbled. Severe illness prevented her from playing the clarinet, so she learned piano and majored in piano at Belhaven. While at school, a long standing relationship was broken, and with it, more of her dreams. Now what, Lord? May 12, 2010: Belhaven Connections is the musical-missions arm of the Belhaven University Department of Music. A team of 13 Belhaven students and faculty, led by Dr. Andrew Sauerwein, are traveling to Tokyo, Japan, May 12-26. Japan is among the most musically literate cultures of the world, and notably one of the least evangelized: less than 1% are Christians, and fewer than 5% will have an opportunity to meet another Christian at some point in their lives. Traditional methods of church planting and evangelism tend to be ineffective in Japan, but music-making is an ideal way to help establish personal relationships in which non-believers can see the gospel being lived out, get involved in evangelical Bible studies, and get connected to local churches. Belhaven Connections will partner with Roger and Abi Lowther ('98 graduate), full-time musical missionaries with Mission to the World, using musical events in churches, schools, homes, and on the street in support of their church-planting work with Grace City Church near Tokyo Station. This area of Tokyo has the political power of Washington D.C., the media power of Hollywood, and the financial power of Wall Street. Please keep the Belhaven team in your prayers as they minister in Japan. For more about the trip and how you can continue to pray, see the "Belhaven Connections in Tokyo" blog. June 17, 2009-Belhaven Connections, the musical missions arm of the Belhaven College Department of Music, returned from Peru on what was their third international missions effort. The group's purpose is to build winsome relational, cultural, and artistic bridges that promote a Kingdom worldview of the Arts and proclaim the gospel of Christ. Dr. Christopher Shelt, Belhaven music professor, led the 15 member group, which included Belhaven composition professor, Dr. Andrew Sauerwein, his wife Quita and daughter, Hannah; recent Belhaven graduates Arthur Alford and Nicole Nutting; Belhaven seniors Abigail Crumley, Micheal Hall, Daniel Johnston, Rachel Reese, and Tory Senete; and high school students Gracie Clark, Virginia and Dorothy Claire Glover, and Jensen Kelley. Belhaven Connections performed a diverse repertoire (classical, Broadway, hip-hop, traditional folk, contemporary folk, Spanish, and pop) to fit their settings, which were also diverse ("Independence Hall," the conservatory, a public university, public schools, an orphanage, two shopping malls, a language institute, and three churches). The team wanted to tangibly communicate the rule of Christ over every sphere of musical expression and every context of musical expression. The concerts were all well attended and received, many had standing room only. 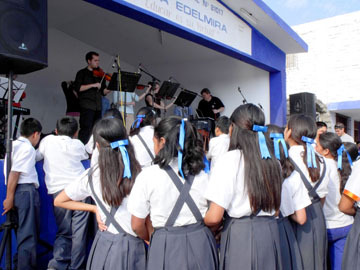 For many of these concerts, the USA team performed alongside the Christian Peruvian band Muyupampa. This Peruvian group skillfully played Peruvian styled sacred and folk music using traditional Peruvian instruments. When audiences saw the two groups' friendship as well as their musical collaboration, the result was a tremendous public statement of cultural respect and unity in Christ. Belhaven Connections was warmly welcomed upon their return to the Peruvian Conservatorio Carlos Valderrama. Dr. Shelt lectured on "Musical Megatrends," taught 5 master classes in voice, and 2 master classes in conducting technique. Recent Belhaven graduate Nicole Nutting taught a seminar on Collaborative Piano (in Spanish! ), student Rachel Reese taught a seminar on String Performance, and student Abigail Crumley, Soprano, performed in a solo recital. The conservatory leadership was so impressed with the quality of Belhaven students and graduates that several were offered teaching positions at the Conservatory should they wish to return to Peru for a longer time. The Belhaven group also engaged church leadership on their visit-through teaching, training, and equipment. To support the musical growth of the churches, the Belhaven Connections team raised funds and hand delivered 7 guitars, a piano keyboard, a portable sound system, and a sound mixer. Both Allen Smith, with PeruMission, and Alonzo Ramirez, a Peruvian pastor working in university ministry, said that these musical missions efforts "break down obstacles" and "open doors of opportunity" with regards to their ongoing ministries. 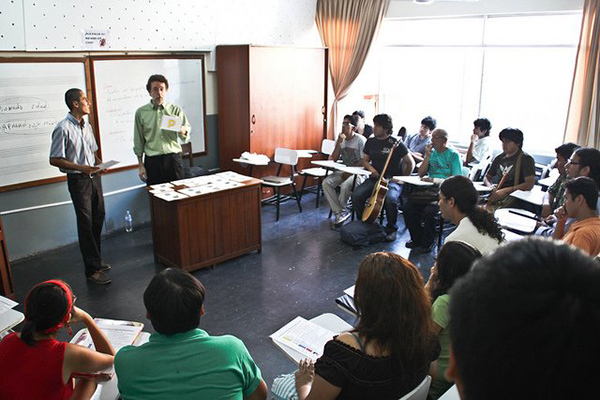 All of the pastors and the missionaries said that the most important result of the testimony and performances of Belhaven Connections was the shattering of the negative Peruvian stereotype of an evangelical. They also said that their missionary labors are taken much more seriously as a result of the team's visits. May 30-June 15, 2008-Belhaven students Lindsey Berg, Hannah Cross, Mandy McCullough, and Tory Senete, along with Belhaven alumni, Jill and Eddie Moran, Natalie Tackitt, Belhaven faculty organizer, Rev. Dr. Christopher Shelt, and Pear Orchard Presbyterian Church member, Deana Dryden, left May 28 on an 18 day ambassadorial mission to Africa with Belhaven Connections, an ongoing Belhaven College musical missions ministry. Last year's Belhaven Connections trip to Peru impacted not just worship and evangelism, but education, government, and business. Dr. Shelt, Belhaven's Coordinator of Vocal Arts and an ordained PCA minister, will take four days to teach the entire book of Psalms to seminary students in Zambia, then preach in local churches, and teach seminars on music and the family from a Christian worldview in Zambia and Uganda. The team's chaplain, ruling elder Eddie Moran, will also minister the Word in local churches and in the seminary chapel services. Jill Moran and Natalie Tackitt will be doing a school assessment for the Centre for Christian Mission Trust School in Zambia. The arts will be featured prominently in the ministry with numerous opportunities for education and cultural exchange in both music and dance. Belhaven Connections will feature musical offerings in both Zambia and Uganda with voice, clarinet, flute, piccolo, and piano. Dancers will teach American folk dances and creative movement in the Trust School and during the cultural exchange festival. The group will hand-carry three Orff xylophones, designed for children's music education, as a gift to the Trust School. The team has also raised $1500 for a new building at the Trust School. Pray for Belhaven Connections as they visit the continent of Africa. 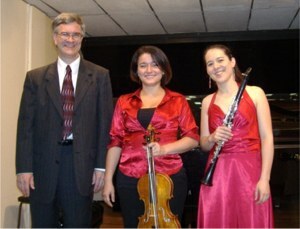 May 19, 2009-Ana Catalina Ramirez, clarinetist and Dr. Stephen Sachs, pianist presented a recital at Belhaven and Mississippi Colleges during 2008-2009 with the assistance of Alejandro Encinas, violist. As Ms. Ramirez is Costa Rican, it was decided that she would seek a recital opportunity in San Jose, Costa Rica. The University of Costa Rica School of Music accepted Ms. Ramirez's proposal. The recital was presented on May 19, 2009 to a standing room only crowd of 125 people in the Recital Room of the School of Music. San Jose violist Maricel Mendez performed in place of Alejandro Encinas who was not able to make the trip. Pianist Mrs. Carolyn Sachs turned pages for rehearsals and the recital. The following day, Dr. Sachs offered a Master Class for 5 Costa Rican student pianists performing works by Liszt, Mozart, Scarlatti, et al. During the week that Ms. Ramirez and the Sachs' were in Costa Rica, there was much time available for practice, cultural immersion, a little sight seeing, and much relationship building among fellow Christians at the University.